The Ahmedabad Declaration 2007: A Call to Action, 4th ICEE Excessive consumption of natural resources and unsustainable lifestyles are consistently increasing the pressure on biosphere. Human impact on the Earth has tripled since 1961 and our human footprint now exceeds the planet’s capability of regeneration by about 25 percent. (“Ecological Footprint is a resource management tool that measures how much land and water area a human population requires to produce the resources it consumes and to absorb its wastes under prevailing technology” ). For last 20 years humans are consuming the natural resources faster than they can be renewed. To avoid irreversible damage the consumption rate should reduce to balance the Earth’s capacity to regenerate and absorb waste. The unsustainable trends need to be stopped and we need to change our lifestyles along with development models to ensure sustainable future. It is vital that we instigate change in order to improve living standards of all and reduce the impact on planet. Choices that we make now will shape our opportunities in future and those of future generations. Technologies to lighten human footprint exists and newer and better models will follow. But availability of alternative models and vision for sustainable future is not enough, what we need is ‘action’. Education is a key driver to achieve this transformation. Education for Sustainable Development (ESD) encourages a shift from viewing education as a delivery mechanism to a lifelong, holistic and inclusive learning process. ESD not only creates awareness but also builds capacity and decision making ability of a community. ESD calls for action! Handprint is a measure of ESD action; action that is directed to decrease the human footprint and make the world more sustainable. Handprint is the symbol of, measure for, and commitment to positive action towards sustainability. Handprint also stands for caring, and working together towards a sustainable future. While the Footprint is a measure of human pressure on earth’s resources, the Handprint is a measure of what we can do individually, and together, to restore the balance between consumption and the planet’s carrying capacity. Positive & tangible action and projects towards sustainability, an integral part of Education for Sustainable Development (ESD). A tool to calculate the extent of ESD action being taken and the positive impact of our actions on Sustainable Development. A symbol of commitment through a pledge to act. A caring attitude. Extending a helping hand in caring for the planet and all life on it. Networking and collaboration. Joining hands for the common goal of sustainability on Earth—the only known living planet. 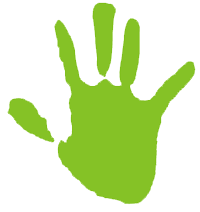 It is Srija's hand that shapes the sustainable handprint's logo. Srija, visiting the Holy Mary School in Hyderabad , Andhra Pradesh (AP), gave her handprint when she was participating in a project of the CEE AP, involving taking action for sustainability. She was 10 years at that time. Srija, who inspired this idea, like many million other children, needs to live in a world that is more sustainable. Every action towards sustainability can count towards creating a better world for all to live in. Launched in 2007 by Centre for Environment Education (CEE) at UNESCO’s 4th International Conference on Environmental Education held at Ahmedabad, India, the Handprint represents the belief that we can make a difference through individual and collective actions to solve the environmental problems. This concept emerged from one of the CEE’s Programmes--Environmental Education in Schools of Andhra Pradesh (EESAP 2000 to 2008). The programme, implemented in 1500 schools, resulted in small action projects in and around schools, and involving communities. This demonstrated that the while the Footprint of a rural child may be minimal, her/his positive actions can be facilitated, supported, and shared to inspire others (local communities, and across the globe) to act so as to contribute to positive impact on environment.